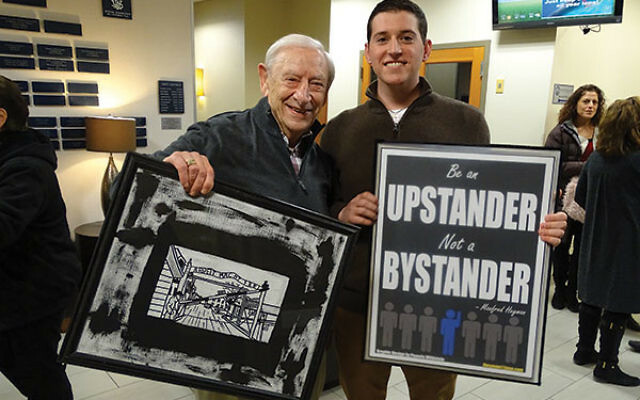 In 2008, when Howard Goldberg was 12, he rode on a chartered bus from New Jersey to the United States Holocaust Memorial Museum in Washington with Fred Heyman, a Holocaust survivor from Berlin. They were traveling on one of the Morris Rubell Holocaust Remembrance Journeys, which are filled with middle and high school students, trips in which Heyman is invariably on board. The Morristown resident, now 87, spends much of the long rides on his feet, microphone in hand, telling his story of living through the horrors of the Nazi era and coming to America. His family, through a combination of luck and circumstances, spent the war years in Berlin. Like many of the young people who have heard Heyman’s story, Goldberg was captivated by the survivor’s urging that they become “upstanders,” not bystanders, when they spot someone in trouble. One such upstander in Heyman’s own life was a Nazi soldier who lied to his supervisors, saying that the then-15-year-old Heyman was too sick to be imprisoned. Others included the superintendent of his apartment building who kept his family hidden from the Nazis, and the Christians who hid and sheltered them during the war. Young Goldberg was determined to spread Heyman’s message beyond the others who had taken the Rubell journeys. So he began a documentary project in July 2015 entitled, “Be an Upstander” — The Fred Heyman Story. He screened the completed work on Jan. 9 at the JCC of Central New Jersey in Scotch Plains. “After hearing Fred speak, I was able to recognize how special his story and message was and what he has done in the past 15 years,” Goldberg told the audience prior to the screening of the 29-minute documentary. For many years, Heyman said, he did not speak of his bitter experiences. Then, after Elouise, his wife of 50 years, died in 2005, he received a call from Barbara Wind, director of the Holocaust Council of Greater MetroWest. She convinced him to tell his story, especially to young people. “She gave me a purpose for my life,” he said. “It became a way of him creating the family he didn’t have because of the Holocaust,” Wind said in a video interview. “Fred is not shy,” said Rubell, who praised the survivor’s knack for telling interesting and dramatic stories. He said when Heyman walks through the Holocaust museum he invariably gains the attention of people who were not part of the Remembrance Journey. “They wind up hanging with us,” Rubell said. Heyman inspired Goldberg — now a senior sports media major at Ithaca College — to become one of Heyman’s 44 “twins” through a program sponsored by the Holocaust Council. Individual boys and girls of bar and bat mitzva age are connected with a survivor. The “twins” form a close relationship with the intention of the youngsters’ passing on their elders’ individual stories to future generations. In a discussion following the screening, Heyman said he worries that the Holocaust might be a prelude to another chapter that could be even more deadly. A member of the audience, noting that most of the attendees were Jewish, asked Heyman whether reactions are different among non-Jews. He replied that usually his audiences are made up of non-Jews, and his message generally resonates more effectively with them.